A delight to grow, tomatillos run rampant on our farm in France. They originally hail from Mexico, where they are adored for their fresh, tangy, citrus-sweet flavour, and used in almost everything. Grill, barbecue, roast or use in stews – But their best use is in a mexican salsa verde , where they combine so finely with coriander, garlic and chilli. 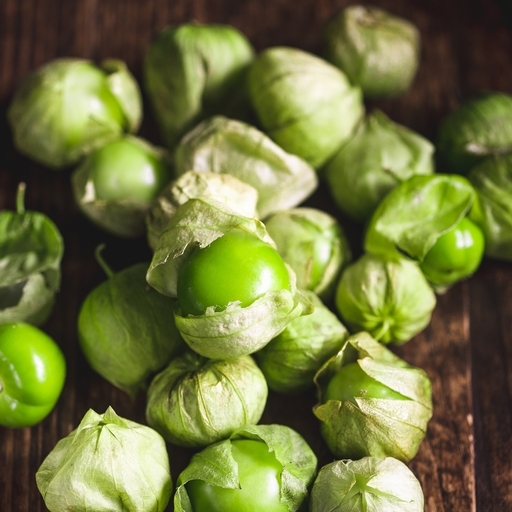 Tomatillos should be firm and green – don’t wait for them to turn red. Remove the inedible papery husk and wash any sticky sap off the fruits. Although they can be eaten raw, cooking tomatillos mellows their acidity. To prepare them for use in salsas or soups, boil for 5-7 mins, until soft. For Mexican salsa verde, combine with diced red onion, a little brown sugar, lime juice and zest, chilli, garlic and fresh coriander. Season with a little salt or sugar to taste at the end. This lends itself to all things grilled – chicken, pork and white fish. Store in the salad compartment of your fridge and use within a week.